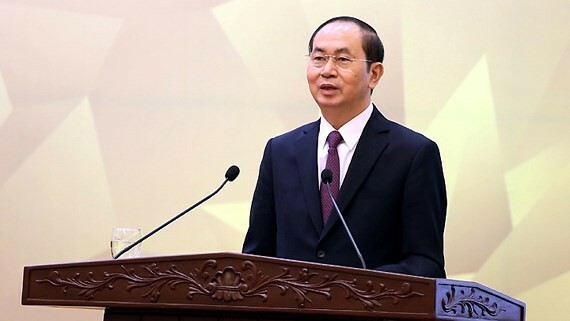 State President of Vietnam Tran Dai Quang yesterday took part in a summation ceremony to review results as well as achievements after APEC Year 2017 in Hanoi capital. 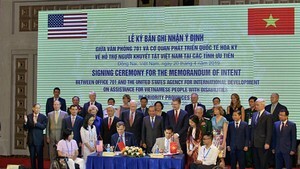 Speaking at the ceremony, President Tran Dai Quang congratulated and honored leaders, officers and soldiers of Vietnam People's Army and People's Police Force, agencies from the central to local levels, enterprise networks, media agencies, artisans, artists and compatriots who contributed to overall success of the 2017 APEC Year. APEC 2017 attracted participation of APEC economics, including leaders of the world’s largest economics and more than 11,000 foreign and domestic delegates, enterprises and reporters. Achievements of APEC 2017 are evidences for the victory of trade liberalization and expansion, and multilateral commerce system which contributed to bring the brighter outlook of the world economy. Besides that, the success also demonstrates the legitimacy of diplomatic guidelines and policies as well as deep international integration of the Party Communist and State of Vietnam, stressed the president. In order to develop role and create the spreading out effects from achievement and success of APEC Year 2017, the ministries, departments, agencies and localities needed to closely collaborate with concerned agencies of the host- economics of APEC to promote result implementation of Vietnam APEC Week 2017. Besides that, the functional agencies needed to focus on building and carrying out APEC vision after 2020 which contributed to affirm strategic role of APEC as the leading inter-economic forum and motivation for global growth and connection.